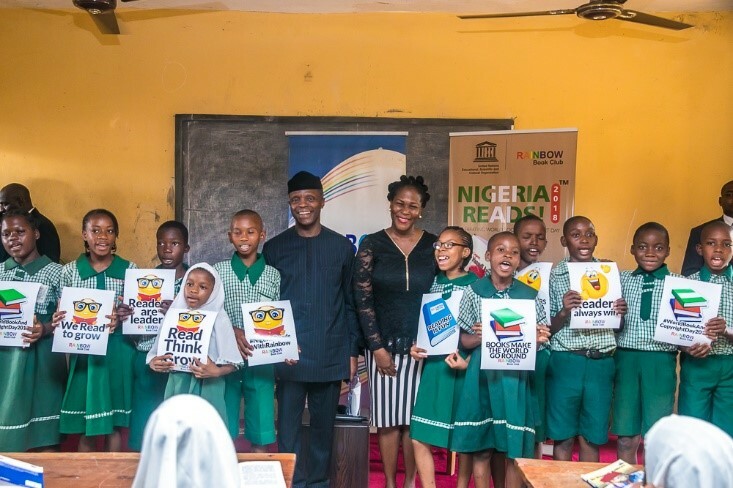 To celebrate the 2018 UN World Book and Copyright Day, the Rainbow Book Club ran her ‘NIGERIA READS’ Programme at the L.E.A Primary School, Life Camp, Abuja. The Vice President, Prof. Yemi Osinbajo read to the students from the book- The Legend: Dr Nnamdi Azikiwe in the company of the Rainbow Book Club Founder, Mrs Koko KalaNgo. Other dignitires in attendance were the Minister of Education, Mr Adamu Adamu and the FCT Minister, Alhaji Muhammed Musa Bello, the UNESCO Country Director, Mr Ydo Yao Represented by Mr Ajaegbo. Students of LEA Primary School, Life Camp, Abuja, present a handmade card to the Vice President and Mrs Kalango after a reading with the VP to mark World Book & Copyright Day (April 23rd) 2018. 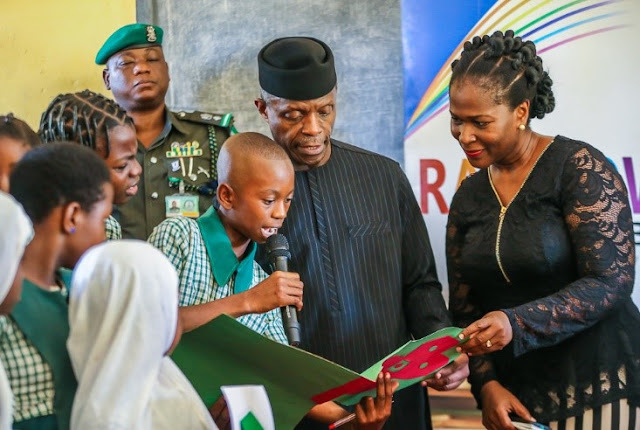 After the reading, there was a question and answer session whereby the Vice President asked the children questions from the book in focus and also answered the questions the children had for him. The students asked him questions on issues such as corruption, marriage, life as a Vice President, his childhood, bullying, and ways to regain the country’s lost glory. 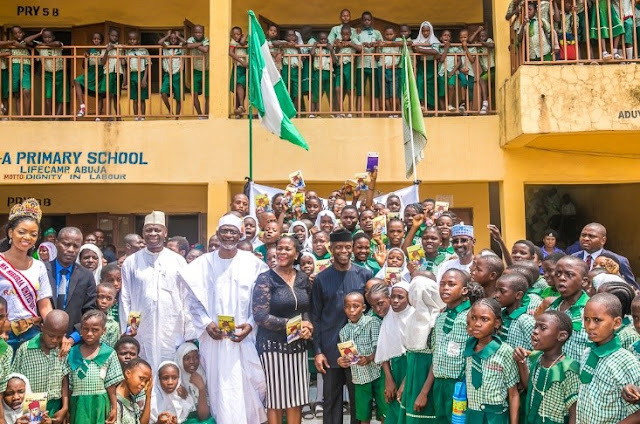 The Vice President answered their questions intelligently while advising them on ways to be better children to their parents and better citizens to their country. The children presented His Excellency with a hand-made card and went on to take pictures with him. 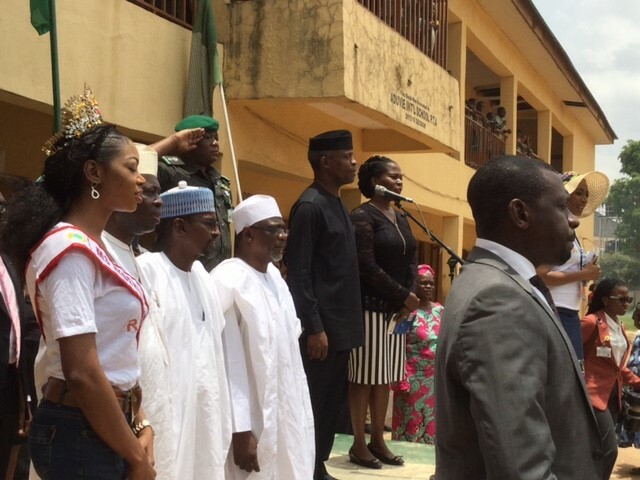 The students and Staff of the L.E.A Primary School, Life Camp, Abuja thanked the Vice President for motivating the children to read and for visiting their school. The also remained very grateful to the Rainbow Book Club for creating the opportunity for them to celebrate the 2018 World Book and Copyright Day. RBC kicked off the ‘Get Nigeria Reading again!’ Campaign in 2005 with Chimamanda Adichie and since then has enlisted the participation of high profile authors, captains of industries, government officials and celebrities to create awareness of the correlation between reading and building a successful nation. Rainbow has managed the Port Harcourt Book Festival (Formerly the Garden City Literary Festival) since 2008. The work of the book club got Port Harcourt nominated as UNESCO World Book Capital 2014. The organisation has run over 200 book clubs in primary and secondary schools, set up 13 libraries, organised trainings for over 500 book club facilitators, organised over 42 reading and writing exercises to groom upcoming writers and published some of them. We have also promoted established writers. 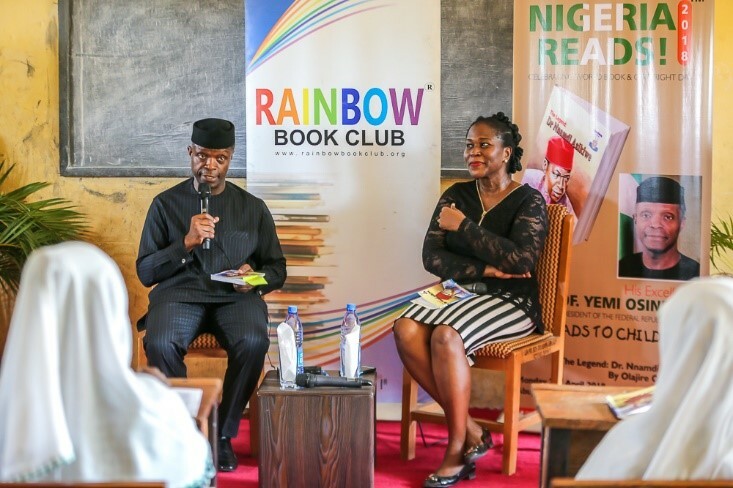 Honorary members of the Rainbow Book Club include; Jesse Jackson, Wole Soyinka, Emeka Anyaoku, Mathew Kukah, Oby Ezekwesili and President Jonathan.